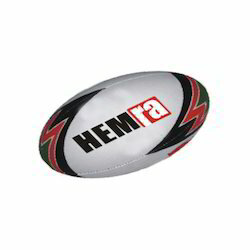 We offer rugby balls to our clients which are made by using a premium quality of raw-materials. These products are made and can be avail in market with a very cost effective price. Moreover these range of products can be customized as per our valued client requirement and specification. Moq 25 pcs per size per quality. Manufactured using latest technology with Synthetic Rubber and Polyester lining, our range of Rugby Balls are available in various sizes and colors. We also offer a gamut of Senior Rugby Balls that are manufactured with 3 ply 14-15, 3 ply 12-13 and 2ply material. We are reckoned entity of this domain indulged in providing an enhanced quality Rugby Ball. We are remarkable enterprise, involved in offering superior quality Rugby Ball. Owing to the rich industrial experience and expertise in this business, we are involved in providing Miscellaneous Rugby Ball. 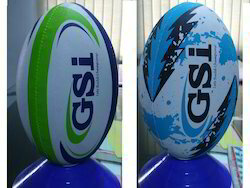 Engaged in manufacturing and exporting of rugby trojan ball, these balls are also used for various rugby fan clubs, wherein the balls are customized with clubs logo and color scheme.